The goalkeepers' trainer of the Black Stars, Edward Ansah, has stated that the assertion that Ghana has a goalkeeping problem is not true. According to him, the Stars have some good goalkeepers whom he is going to work on to become great assets to the nation. In an interview with the Graphic Sports last Wednesday, Ansah, as he is affectionately called, stressed that he has quality goalkeepers in Sammy Adjei, Louis Quainoo and Richard Kingston and was going to ensure that they form a strong barrier behind the defenders during the World Cup campaign which begins tomorrow against Burkina Faso in Ouagadougou. “I'm going to use the experience gained in my career to transform them,” he assured. Describing his new appointment as a surprise, he still thought he deserved it since the appointing officials, in their own wisdom, considered him to be the right choice. According to him, the Stars stand a good chance of qualifying for the World Cup considering the current crop of players in the team. The former international noted that the government's new financial package to the team would be a fantastic boost for the players to work harder. He therefore urged Ghanaians to back the team with their prayers as they embark on yet another long World Cup journey. 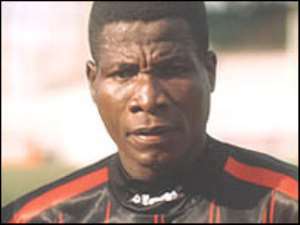 Ansah who was appointed in the same capacity under Burkhard Ziese last year was the target of vilification from the general public after the German coach converted him into his number one goalkeeper for the Stars. Reacting to that experience, he said though he thought the attack was not justified, he had to take it in his strides and remain focused.